Pepper pot 5 lbs. of tripe -- 12 white potatoes knuckle of veal 2 teaspoons of thyme & sweet basil. 5 qts. of water. Small dumplings -- boil four hours. 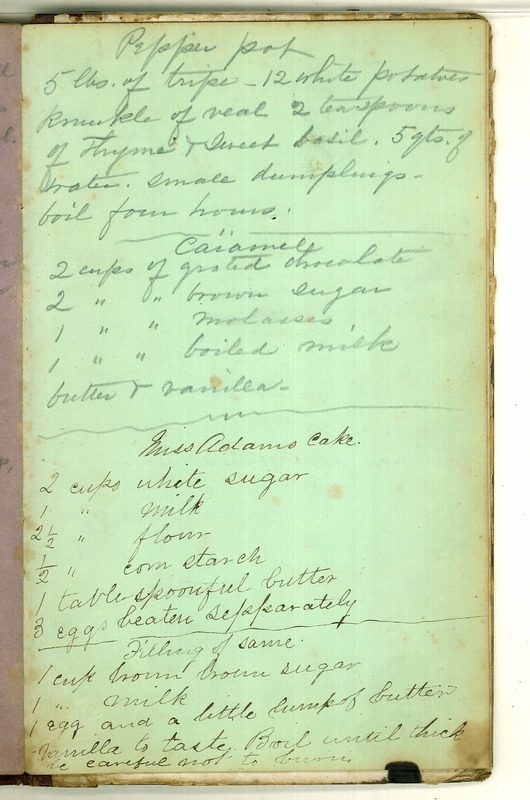 Caramels 2 cups of grated chocolate 2 " " brown sugar 1 " " molasses 1 " " boiled milk butter & vanilla Miss Adams Cake 2 cups white sugar 1 " milk 2 1/2 " flour 1/2 " corn starch 1 tablespoonful butter 3 eggs beaten sepparately Filling of same. 1 cup brown [brown?] sugar 1 " milk 1 egg and a little lump of butter Vanilla to taste. Boil until thick be careful not to burn.